This penetration of a coin through a handkerchief is the second method, described on page 68, of The New Modern Coin Magic by J.B. Bobo. 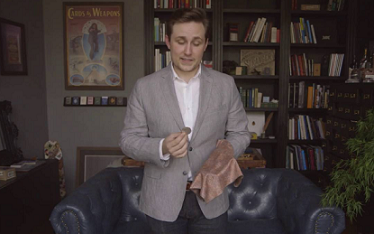 A coin apparently melts straight through the fabric of a common pocket square or gentleman's handkerchief. This fascinating penetration can be performed at a moment's notice, using only a bit of fabric and some sleight-of-hand. Not only is the effect described, Elliott teaches a fundamental technique that will help you fool audiences regardless of your performing circumstances.